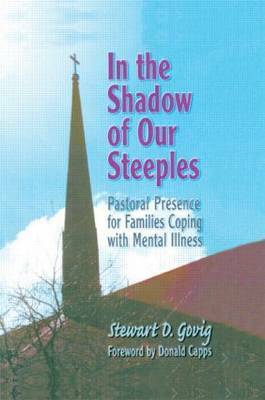 In the Shadow of Our Steeples: Pastoral Presence for Families Coping with Mental Illness helps you and other experts and quasi-experts in the field of religious and family counseling to give sound direction and guidance to family members who are caring for a loved one who suffers from mental illness. You'll find many avenues of care and counseling that will greatly enhance your ability to lend support and encouragement in situations where the burden of care seems too great for only a few individuals to lift. In reading it, you'll find your options increase tenfold, and you'll become a better symbol and resource of faith for these unique families.Inside In the Shadow of Our Steeples, you'll discover how to cure the obsession with success that too often goes along with counseling situations that involve mental illness. You'll also discover a greater, more enduring strain of Christian love, full of surprising joys, caring, and hope. Geared toward moving parishes away from public stigmas and toward a collective ministry of presence, this book beckons to those clergy who know and believe that a far more understanding and far-reaching form of counseling exists. Specifically, you'll learn about these and other long-sought-after aids: establishing theological foundations and goal-setting in the area of pastoral care countering the stigmas of mental illness using biblical studies and models using a "ministry of presence" to analyze chronic illness and promote "rehabilitation in the absence of cure" bringing clergy and mental health professionals into a collaborative arena of care improving the relationship of professional chaplains to clergy in ordinary parish settingsOverall, In the Shadow of Our Steeples helps bring together the sufferer, the family, the civil servant, and the religious counselor into one synergistic group of rehabilitative influence. This sound guide's specific examples and proven strategies will help turn your despair into hope, even in the face of chronic mental illness.